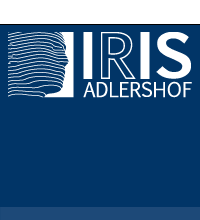 The Integrative Research Institute for the Sciences IRIS Adlershof of the Humboldt-Universität zu Berlin explores novel hybrid materials and functional systems with so far inaccessible optical, electronic, mechanical and chemical properties. This research is connected to fundamental studies of structure and dynamics of matter on extreme length and time scales and in complex systems. Colloquium of the Department of Chemistry: Prof. J. F. Teichert (TU Berlin) on "H2 activation with copper/NHC complexes – starting point for chemoselective catalytic transformations"
Colloquium of the CRC 951 HIOS: Prof. M. Kivala (Umiversität Heidelberg) on "From Simple Triarylamines to Functional Heteroaromatic Scaffolds" and Prof. S. Klapp (TU Berlin) on "Morphology, growth and dynamics of organic molecules at structured surfaces"
Berliner Physikalisches Kolloquium: Prof. M. Bonn (MPI für Polymerforschung, Mainz), lecture on:"Hydrogen bonding at water and ice interfaces"